→Pocket Hose Review 2019 : Does It Really Works or Not? Gardening is one of the very engaging and creative hobbies among people all over the world. If you love gardening, then it is highly likely that you are also interested to know about the latest and most advanced gardening tools and practices. In this article, we shall tell you about one of the most amazing innovations that will certainly impress you to no end! Have you ever come across the pocket hose as seen on tv? If no then read our Pocket Hose Review. What is the Pocket Hose? Well, even if you are yet to watch the Pocket Hose commercial on your TV, you can jolly well figure out what it is all about. The Pocket Hose is basically a garden hose that comes in an amazingly compact size. It is manufactured to comprise of two layers to offer greater durability and stability in performance, just like a fire hose. The outer covering of this Pocket Hose is made up of a seamless biaxial braided material while the innermost layer is an elastomer hose that is developed using the latest scientific ideas. It comes fitted with a turbo jet nozzle at one end. The pocket hose as seen on tv shows that there are two white stripes that run along the entire length of the hose pipe. The manufacturer claims that these stripes are Solar Stripe Shields which protect the Pocket Hose from the harmful effects of the UV rays of the sun and make it last longer. The pocket hose comes with the following things included in the box. What are the advantages of using the Pocket Hose? The Pocket Hose, as rightly advertised, it really pocket sized in its dimensions. Its miniature size does not let it occupy much space at all. When you unravel it, it reaches the length of any standard garden pipe, but after packing it up, you will never want to believe that it is the same long pipe here. The Pocket Hose is especially suitable for the users who have limited space for storage or live in a very compact house. According to our review, users find it really easy to store in the smallest of spaces, inside drawers or even carry it inside your pocket, as the name suggests. Unlike the regular garden hoses which are too bulky, this Pocket Hose will consume the least amount of space inside your house. The pocket hose is also very easy to use. You will just need to unpack it from the packaging, fit it to the source of water like any other garden hose and turn on the flow of water to use it. There is a valve at one end of the Pocket Hose that you can use to adjust and alter the flow of water through it. As the water gushes through the Pocket Hose, it will automatically expand to its full length. Just like the Pocket Hose expands to its full length with the force of water flowing through it, when you turn off the water supply, it promptly collapses back to its original compact form. The users in their pocket hose have highly lauded this feature, saying it is of tremendous help and also saves a lot of their time. The pocket hose is available in a variety of different lengths. You can choose from any of the available lengths depending on your own requirements. The Pocket Hose is available in lengths of 25 feet along with 50, 70 and 100 feet. The price of the Pocket Hose will vary based on the length that you choose to buy. In case you are not very happy with the product, you can choose to return it with its original packaging to the manufacturer and get a full refund of your money. The manufacturer offers a lifetime guarantee on this product, however, do not forget to read the policies and guidelines in case you wish to return the item. Although there are rave reviews about pocket hose where most of the users seem to be pretty satisfied with this product, there are many who differ in their opinion. Many people seem to be not very happy with the quality of the product that they received. Some of them have mentioned that this product has appeared to be a high-quality item. But the one that was delivered to them did not match up to their expectations. They expressed their disappointment about the leaks and rips that seemed to appear on their Pocket Hose. The manufacturer has mentioned that you must not try to stretch the empty Pocket Hose since there are chances that it might snap back to its compactness and hurt you. Also, you must make sure that the Pocket Hose is only used in situations where the pressure level is under 80 psi. 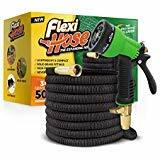 The pocket hose amazon is meant for use outdoors only and it should never use with pressure washers or with hot water or any appliances that require the use of hot water. The device can easily lead you into imagining that this is the best extendable pocket hose product as claimed by the manufacturer. However, we would say that before you decide to buy the Pocket Hose, you MUST always go through the reviews as much as you can. The Internet is full of reviews about anything under the sun, and the Pocket Hose is no exception to this. It is always smart to set realistic expectations here, and the pocket hose reviews are going to be the best source of information for you. But if you are running short on storage space and want to buy a compact garden hose that delivers fair performance compared to its price tag, the Pocket Hose is going to be a decent product.